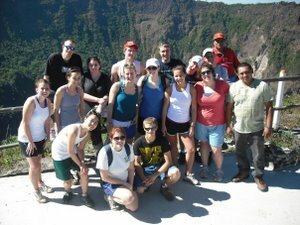 Hannah Ford, a student at the University of Cinncinnati, writes about the two Global Builder trips she took to El Salvador–most recently in December of 2009. ¡Hola! I recently returned from my second service trip to El Salvador through Serve Beyond Cincinnati in conjunction with The Fuller Center, and it was even more incredible than the first time that I visited. My team was led by Katy Dietz and Mark Teschauer, two seniors at the University of Cincinnati, and it consisted of 14 dedicated and hard-working undergraduate students. We worked at two different worksites during the time that we were there. The first worksite was in Santa Cruz. Although November is not part of El Salvador’s rainy season, it rained for three straight days at the beginning of that month. This was incredibly destructive for the country – the mudslides from all of the rain knocked out many of El Salvador’s highways and destroyed numerous bridges throughout the country. Many homes in this country are not stable or well-built, and therefore, many houses were also washed away along the rivers. The ones along the rivers that weren’t washed away had up to three or four feet of sand and debris in them. For the first few days, we worked The Fuller Center for Housing of El Salvador along one of the rivers where a bridge had been knocked out and washed downstream. One day at this worksite, we carried up several rocks from the river to rebuild a home that had been destroyed. That day and the other days, we worked in groups and cleaned out the debris from several homes. The owners of these homes had been living in them since the mudslides, despite the damage and how dangerous it was. In one home, we had to dig about a foot and half of sand out, and we dug not only sand and dirt up, but also a layer of clothes that had been buried during the mudslides. The woman who lived in this home also had an extremely unsturdy wall built from mortar and concrete slabs separating her home into two rooms. It was so weak that we had to knock part of the wall down – if another storm came, it was possible that the wall could collapse on one side of her home and crush her and her belongings. Working at this site really touched my heart because it was of immediate need and not something we planned to do before our arrival. The rest of the work we did was in San Luis Talpa. We worked with The Fuller Center on the same site where we worked last year. This site is part of a large project to build a new community with 100 homes and other residential services. It was really awesome to see that many of the homes we worked on last year are now lived in and being used by local families. It’s amazing how much can happen in a year! The site also acquired a concrete mixer in the past year. This has been so beneficial for the site because it requires much less physical labor and increases the speed of the mixing process. The mixer is nothing too fancy or big, but it certainly makes the labor easier. One day, we built a sidewalk for one row of homes. Another day, we built–or rather poured–an entire home. Before The Fuller Center had the mixer, the homes were built from cinder blocks and they took days to build. Now that it has the mixer, homes are able to be built in a single day by using a giant mold and pouring concrete in it. With the help of our 14-member team, the team from UCLA, and the local masons, we poured the home in a single day. On the final full day that we were there, we poured floors for a couple of the other concrete homes. This trip was even greater than when I came to El Salvador last year. It was different for me because I had already become a witness to the extreme level of poverty in El Salvador during my first trip. My awareness inspired me to research throughout the past year about the country to gain an even deeper understanding and share with others the things that I had seen and learned. Being in the conditions of a country such as El Salvador has made me change my entire lifestyle. Reflecting on the limited water supply (or lack of water supply for some), the low income, the need for food, the unimportance of material things, and the high amount of violence makes me think again about how much I take for granted here in the United States, where it is so easy to take things for granted and have more than I could ever wish for. We are so undoubtedly lucky. To sign up for a Global Builders trip click here or return to the Global Builders home page.